Ever wonder why the doctors tell you that you can't use a straw after having your wisdom teeth (or any other teeth) removed? It's because of a condition most commonly known as "Dry Socket." 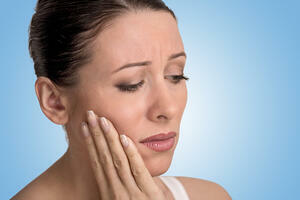 Dry socket affects approximately two percent of people who have wisdom teeth extracted. Throbbing pain in the surgical area that lasts for two to four days is the primary indication that you have developed dry socket. Other common symptoms include an unpleasant taste in the mouth and persistent bad breath. How Does Dry Socket Develop? Your blood should clot to facilitate healing and prevent infection in a typical procedure for the removal of wisdom teeth. This does not happen when a dry socket develops, which means that the nerves remain exposed. The nerve exposure can cause severe pain and jawbone inflammation. The technical name for this condition is alveolar osteitis, named for the alveolar bone in the jaw that becomes inflamed and infected. There is a higher incidence of dry socket developing when an oral surgeon removes the lower wisdom teeth. Smoking: The frequent inhalation of nicotine can cause a decreased blood supply in the mouth. This can mean that blood might not clot properly after any type of oral surgery, including the extraction of wisdom teeth. Personal factors: A patient’s hormone levels, density of the jawbone, or a pre-existing poor blood supply in the mouth can all contribute to the development of dry socket after wisdom teeth removal. Actions after the surgery: We advise patients to avoid sucking through a straw, smoking, spitting, or rinsing their mouth too aggressively after oral surgery for good reason. Each of these actions can cause a previously formed blood clot to break open and expose the roots. Some patients are fortunate enough to get the relief they need by taking non-prescription pain relievers. If you have tried that and still feel uncomfortable, contact Northwest Oral & Maxillofacial Surgery for an immediate appointment. The oral surgeon who performed your wisdom teeth extraction can write a prescription for a stronger painkiller if necessary. When you to return to our office with dry socket, your oral surgeon will clean the affected area, remove any particles that have lodged in the opening, and fill the socket with a special dressing to speed up the process of healing. You should expect to come back every few days so we can check your progress. We will continue to treat any other complications that might arise. Your oral surgeon may prescribe an antibiotic in addition to a pain reliever to prevent further infection. You can care for your dry socket at home by rinsing daily with salt water. If you smoke, it is essential to quit before the day of your scheduled wisdom tooth extraction. Birth-control users may wish to schedule the appointment for the day they receive the lowest estrogen dose in order to prevent hormonal complications. We also encourage you to discuss your current medications with us prior to surgery to determine if any of them might cause potential complications. Please don’t hesitate to contact Northwest Oral & Maxillofacial Surgery with additional questions about wisdom teeth removal or this rare complication.